He says community colleges are crucial to keeping jobs in U.S.
(CNN) -- Community colleges are only two-year institutions, but the Obama administration says they could play a key role in helping boost the ailing economy for years to come. 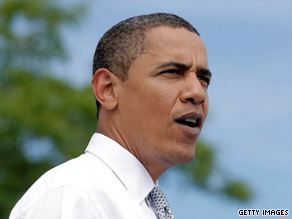 President Obama also announced a goal of 5 million additional community-college graduates by 2020. To underscore that contention Tuesday, the president unveiled the American Graduation Initiative, a 10-year, $12 billion plan to invest in community colleges. During his announcement at Macomb Community College in Warren, Michigan, Obama noted that the economic recession and a changing U.S. economy have reduced the number of automotive industry jobs, a mainstay in Michigan. The "hard truth is that some of the jobs that have been lost in the auto industry and elsewhere won't be coming back. They are casualties of a changing economy," Obama said, adding that "even before this recession hit, we were faced with an economy that was simply not creating or sustaining enough new, well-paying jobs." Obama called the investment in community colleges crucial because "jobs requiring at least an associate degree are projected to grow twice as fast as jobs requiring no college experience" in coming years. "We will not fill those jobs, or keep those jobs on our shores, without the training offered by community colleges," he said. Education Undersecretary Martha Kanter says the plan is a crucial investment because community colleges have not historically "done enough to get students through, to move them into the work force and to get them through the higher-education transfer programs." She added that "we're very concerned about providing access and opportunity during this terrible fiscal climate." The initiatives focus on four areas that officials say are aimed at giving community colleges the resources needed to modernize and assist students who are struggling, according to Kanter and other senior administration officials. • Community college challenge grants, to help underfunded colleges that are dealing with limited capacity and to build partnerships with schools and businesses. • The Access and Completion Fund, to provide performance-based scholarships and give colleges the tools to design more programs around work schedules. • Modernization of community-college facilities, with $2.5 billion to help renovate facilities and keep up with maintenance costs. The renovations will create jobs, Obama said. • Open online courses, to create options online as a tool that some think can be more effective than classroom instruction alone. There are 6 million Americans in community colleges. The administration's initiatives are seen as the foundation to help boost enrollment and graduation rates. Obama also announced a goal of 5 million additional community-college graduates by 2020. He said the initiative will not add to the deficit because the investment will be paid by "ending the wasteful subsidies we currently provide to banks and private lenders for student loans, which will save tens of billions of dollars over the next 10 years." "Instead of lining the pockets of special interests, it's time this money went toward the interest of higher education in America," he said.